Erik J. Engstrom offers a historical perspective on the effects of gerrymandering on elections and party control of the U.S. national legislature. Aside from the requirements that districts be continuous and, after 1842, that each select only one representative, there were few restrictions on congressional districting. Unrestrained, state legislators drew and redrew districts to suit their own partisan agendas. With the rise of the “one-person, one-vote” doctrine and the implementation of the Voting Rights Act of 1965, however, redistricting became subject to court oversight. Engstrom evaluates the abundant cross-sectional and temporal variation in redistricting plans and their electoral results from all the states, from 1789 through the 1960s, to identify the causes and consequences of partisan redistricting. His analysis reveals that districting practices across states and over time systematically affected the competitiveness of congressional elections, shaped the partisan composition of congressional delegations, and, on occasion, determined party control of the House of Representatives. Erik J. Engstrom is Professor of Political Science at the University of California, Davis. "Explorations of American political history often demonstrate that patterns or influences familiar today also existed in the past. 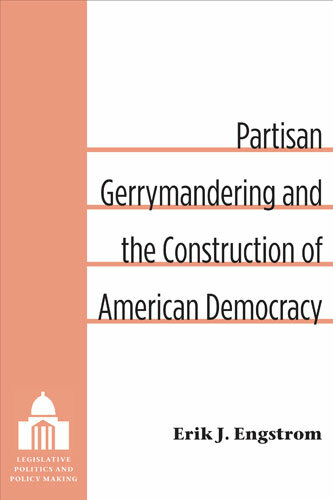 Erik Engstrom’s new book Partisan Gerrymandering and the Construction of American Democracy does not fit that mold. In the course of a thoroughgoing examination of redistricting in the nineteenth century, Professor Engstrom addresses a major contemporary disconnect between the beliefs of practicing politicians and the prevailing conclusions of the academic community. Both Democrats and Republicans expend significant resources trying to position their party to draw post-census maps for Congress and state legislatures and, if unsuccessful in those efforts, they attack the handiwork of the opposition in the courts. Despite the significance accorded redistricting by practicing politicians, the consensus among political scientists is that gerrymandering has little impact on party fortunes. Professor Engstrom makes a compelling case that, in the past, the creation of districts made a difference, at times even tilting the balance in Congress and thereby impacting consequential policy decisions. This meticulously researched volume explores the consequences of districting—or, as in the early days of the republic—the decision by some states not to district, but to elect their delegations at-large." "Decennial redistricting, equal population, majority-minority districting, have transformed contemporary redistricting, but a look to the past, as deftly analyzed by Engstrom, better informs us of how altering voting boundaries impacts politics."